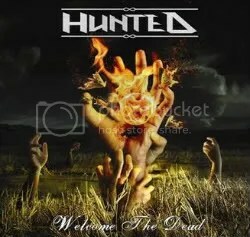 Based out of Wales, Hunted are a band that’s 100% metal but they provide a few slight twists and turns throughout Welcome the Dead. Progressive, thrash, power and melodic metal really seem to be the key ingredients in making up this album. These guys were obviously influenced by bands like Metallica, Dream Theater, Iced Earth, Iron Maiden, Helloween and Nevermore (who they cover on this album with “The Heart Collector”). Vocalist Chris G reminds me a lot of Tim ‘Ripper’ Owens and Warrel Dane so he’s certainly more than able to handle these songs with power, precision and pitch. The production is great and I felt the drums especially were captured very well. To be honest, this album took me a few spins to get into it. That’s not a knock on Hunted, that’s usually the norm for me when it comes to any band with a progressive sound. I’ve since been able to sit back and soak in the wonderful hooks, melodies, riffs and vocals. Hunted is really a band that should be on some type of label somewhere, they’re just that good. Songs like “Scars” and “The Silence of Minds” are pretty fantastic and need a wider audience. This band obviously knows what they are doing. The music and the CD packaging have superior production values, so hopefully this album will get them onto a label so they can gain some more exposure. Welcome the Dead is a very good find for progressive/power metal fans.